Stagnant wage growth, anemic consumer spending, below-average inflation, and plunging oil prices: without any other context you might conclude that the U.S. stock market should be falling off a cliff. Instead, U.S. stocks have returned over 200% since the financial crisis. Are we missing something? The answer is no, we are not missing anything, but we might be confusing the U.S. economy with the stock market. It is incorrect, albeit tempting, to draw conclusions about stock prices from economic headlines. This same mantra holds true for economies at home as it does abroad. In this quarterly review we’ll look at historical returns from major economic regions as well as a few examples of economies and their respective stock market performance. What the chart above illustrates are the index returns for the major economic regions throughout the world. You will see there is no identifiable pattern to predicting when a specific region will be the best or worst performer, so one important conclusion we can draw from the chart is the need for global diversification. Despite embarking on one of the most aggressive economic stimulus programs ever seen, Japan’s economy continues to struggle. The threat of deflation still looms, government debt continues to grow, and Fitch has recently downgraded Japan’s credit rating. Meanwhile the Nikkei (Tokyo’s Stock Market Index) is at a fifteen-year high. You’ll note in the chart that the index that tracks Japanese companies (+14%) is the best performing country/region to date, above Europe, the Emerging Markets and the United States. Like Japan, Europe is also in the midst of fighting unemployment, flat GDP growth and negative real interest rates. To add to Europe’s woes, there is increased political instability in the Eurozone as the fate of Greece remains uncertain. Just before the end of the quarter, Greece defaulted on its latest debt repayment to the International Monetary Fund (IMF) and even more recently has voted against further austerity measures. While Greece itself is a relatively insignificant economic piece of investor portfolios (most of its debt is owned by European governments) its political impact is potentially concerning. What happens next for Greece, and whether it will remain in the Eurozone or not, remains uncertain. Even in the face of this uncharted territory, however, European stocks have returned close to 5% year to date. 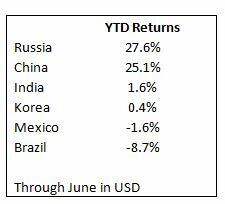 You might be surprised to see that two of the best performing emerging countries year-to-date are China and Russia. In the case of China, where painful economic reforms are being implemented, the economy is slowing from its previous furious, but likely unsustainable, pace. Meanwhile Russia’s economy is experiencing a severe contraction – a response to lower oil prices and geo-political sanctions. How can the stock markets around the world be performing well when all you read about is bad economic data? It’s critical to remember that the stock market is forward-looking and incorporates the future expectations of its participants. For example, if bad economic data is expected and already incorporated into stock prices, the market will simply remain steady if those expectations are realized. Further, if a bad economic headline is not as dismal as what is priced into the market, stock prices could actually increase. We saw this scenario most recently after the Greek default: U.S. and broad-based foreign markets were largely positive the day immediately following the default, an event that markets have viewed as probable for many years. We know we can’t predict the future, but we can say with certainty that there will always be frightening, or at least disappointing, economic news. You can, however, rest assured that the best plan for financial success remains the combination of broad diversification and emotional restraint.